Lawmakers must help the tens of thousands of children who don’t have enough to eat. It’s shocking to learn that 1 in 6 children in Hawaii — 54,650 keiki — struggle with hunger. The sad statistic comes from a 2016 study by Feeding America, a national nonprofit network of food banks that serves tens of millions of people each year. In total, the study says 168,030 people go hungry in Hawaii, or 1 in 8 people. Produce for sale at the KCC Farmers Market, April 2017. Legislation moving at the Hawaii Legislature could go a long way toward alleviating hunger. 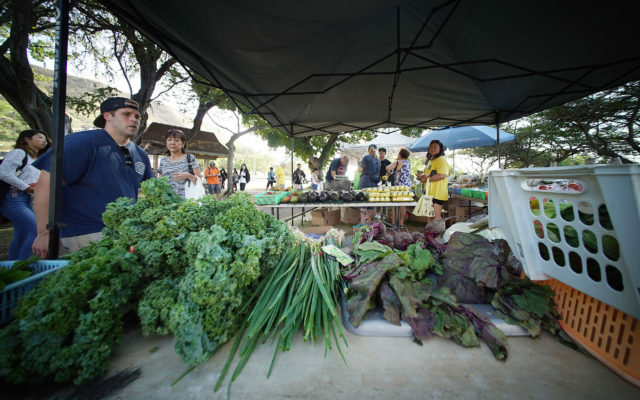 Senate Bill 390 would provide a state dollar-for-dollar match for local folks receiving federal Supplemental Nutrition Assistance Program to purchase Hawaii-grown produce. SNAP, which used to be known as food stamps, provides temporary help to buy food. In Hawaii, almost 170,000 residents receive monthly benefits. And 35 percent of households receiving SNAP benefits have children. SB 390 takes advantage of the national Double Up Food Bucks program, which incentivizes use of SNAP funds to purchase fruit and vegetables. It’s already in place at markets in Waianae and Kalihi on Oahu, and around the Big Island including at KTA Super Stores. The dollar-for-dollar match can allow for as much as a $20 coupon or voucher per visit per day. It essentially doubles a participant’s purchasing power as well as doubling revenue for grocers and farmers. This bill is a common-sense, compassionate measure. SB 390 is so popular that it has received no testimony in opposition but tons of support from state and county officials, social justice groups, farmers, health advocates and more. In spite of its popularity, anything can happen to weaken or kill legislation, especially ones requiring money. The dollar figure remains blank in SB 390, which now awaits a hearing in the House Finance Committee. It’s unacceptable that so many children and families are going hungry in our state. This is a good use of our public money and the Legislature shouldn’t hesitate to pass it on to Gov. David Ige.